The idea that all men (and women) are equal before God is biblical. Paul states as much in Galatians (3:28) and Colossians (3:11) where he says those who are sons (and daughters) of God through faith “are all one in Christ Jesus.” But this isn’t the equality symbolized by the white clothing in LDS temples; for, regarding LDS temples, there is a significant distinction between classes. As I see it, in Mormonism there may not be a distinction between the wealthy and the poor, the educated and uneducated, or the professionals and the non-professionals; instead, there is a distinction between the tithe-payers and the non-tithe-payers, the tea-abstainers and the tea-drinkers, the meeting-goers and the meeting-skippers. This brings to mind Jesus’ parable of the Pharisee and the Tax Collector. “Two men went up into the temple to pray, one a Pharisee and the other a tax collector. The Pharisee, standing by himself, prayed thus: ‘God, I thank you that I am not like other men, extortioners, unjust, adulterers, or even like this tax collector. I fast twice a week; I give tithes of all that I get.’ But the tax collector, standing far off, would not even lift up his eyes to heaven, but beat his breast, saying, ‘God, be merciful to me, a sinner!’ I tell you, this man went down to his house justified, rather than the other. For everyone who exalts himself will be humbled, but the one who humbles himself will be exalted.” (Luke 18:10-14). Temple-worthy Mormons clothe themselves in white in LDS temples to symbolize their purity — their worthiness — to be in the house of God. The fact that they have been approved to enter the temple means that they are not like other people. They have passed their temple recommend interviews which indicates that they are full tithe payers. They attend their Church meetings. They sustain and follow all their Church leaders. They obey the Word of Wisdom. They live chaste lives that are in complete harmony with the teachings of their Church. They keep their temple covenants. They wear their garments day and night. They are honest in all things. They affirm and believe that they are worthy (see Temple Recommend Questions). In telling the parable, Jesus didn’t have any praise for the one who was worthy, for the one who kept the law. Jesus said it was the sinful tax collector, not the law-abiding Pharisee, who went home justified. Jesus didn’t seem to care one whit that the Pharisee paid his tithe while the tax collector (as was typical in his profession) engaged in frequent dishonesty. This is what Jesus cared about: The tax collector, recognizing his sinfulness, cried out for mercy — and he was granted mercy. The Pharisee, who set himself apart as one who was pure and worthy, who relied on his own impressive merits to please a perfectly Holy God; though righteous by the world’s standards, he did not please God and went home still guilty in his sins. The Bible tells us that “none is righteous, no, not one” (Romans 3:10). “If we say we have no sin, we deceive ourselves and the truth is not in us” (1 John 1:8). “If we say we have not sinned, we make Him a liar, and His word is not in us” (1 John 1:10). I’m not suggesting that Mormons think they’re sinless. I don’t think there are many people who do — we know ourselves too well for that. But our human tendency is to minimize and/or justify our sin. We grade the level of “righteousness” we’ve achieved on a curve. “I’m not perfect, but I’m a lot better than that guy,” we say. The Pharisee boasted in his righteousness and was left spiritually bankrupt. His boasting — his self-promotion of his “worthiness” — was itself a display of his sin. Note that the Pharisee in this parable was not bragging to others. He was standing by himself, giving thanks to God. But the tax collector did not even consider himself worthy enough to lift his eyes to heaven as he prayed. He beat his breast while pleading, “God, be merciful to me, a sinner!” He needed a Savior, and he knew it. He admitted it. He begged for it. And he got it. “If we confess our sins, He is faithful and just to forgive us our sins and to cleanse us from all unrighteousness” (1 John 1:9). In the parable both the Pharisee and the tax collector were equally unworthy, but only one recognized his need for mercy. Mormonism claims the purpose of LDS temples is to provide everything necessary for the exaltation of those deemed worthy enough to enter; the temple is for Mormons who affirm and believe in the value of their own righteousness. Jesus or the temple. The choice is yours. This entry was posted in Christianity, Mormon Temple, Worthiness. Bookmark the permalink. There are many interesting observations here, and some criticisms that may be true of some people. In any society, religious or otherwise, there will be a portion of people who are more proud or arrogant than they ought to be. Certainly one of the purposes of the Gospel of Christ is to teach us humility, long-suffering, patience, etc. We don’t acheive those automatically. No true Christian, Latter-day saint or otherwise, is immune from the necessity of learning “line upon line, precept upon precept”, and all of us have our unique challenges. For some the challenge is to be obedient without being proud, others have different challenges. Having said that, having been a Mormon Bishop and serving currently in a Stake Presidency, I can tell you that MY experience and the experience of those I speak to, having been involved in literally thousands of interviews for temple recommends, is that most Latter-day Saints are deeply humbled to have the opportunity to go to the temple. It is true that they sacrifice their means in order to pay their tithes, they sacrifice their natural desires to abstain from the things they have made covenants to abstain from, they sacrifice their time to attend meetings and to serve others, and they do everything else necessary to qualify to attend the temple. In the temple they make covenants with God, they learn, they worship and they serve. There is no sense of being greater than anybody else, but there is a quiet gratitude for the privilege of being in a sacred place. I love the parable you address, but I’m not sure it is applicable here. The sin of the Pharisee was not his obedience, but his arrogance. I have tried all of my life to be obedient to the things I believed God wanted me to do, yet have felt, like the tax collector, the need to cry for mercy when I so often fall short. That is an attitude I have seen over and over. I’m sure you don’t mean to imply by your use of this parable that the obedient are NOT approved of God or are somehow deemed unworthy BECAUSE they are obedient. I think the lesson here is that TRUE obedience brings humility and a recogintion of our dependence upon the atonement of Christ for mercy and salvation. Because there are some Latter-day Saints, even those “worthy” to attend the temple, who are still learning this lesson, shouldn’t condemn the others who humbly and worthily serve. The temple is, among other things, a place to make covenants with God to serve him and to build his kingdom and to maintain our obedience to his laws and commandments. It is a place of “higher learning” designed for those who have already made covenants of baptism and have gained a level of knowledge of God, of Christ and of his Gospel. Imagine a graduate school that had no entrance requirements. It could tout it’s “equality” and it’s desire for all to participate, but the fact is that those who were unprepared would enter the graduate school and fail. Similarly, those who go to the temple are required to show a degree of preparation by being faithful to the covenants they have already made. The recommend interview questions are a time of self reflection and honest appraisal of our commitment to continue on the path, and our desire to know more, to serve more, and to gain the capacity and power to “endure all things”. The equality exists becasue ALL who are willing to make the necessary commitment can gain access to the temple — not to exalt themselves over others, but to gain a greater capacity to serve. 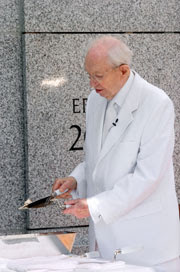 As far as the white clothing, I have never seen that as a symbol of my own purity, but as a show of respect for that holy place, as a symbol of our united desire to be pure even as Christ was pure, and certainly as a symbol of equality before God as we serve and covenant together without respect to wordly possessions or position. I felt that Sharon’s post, while purposefully critical, was also thoughtful and resectful. I hope this reply is taken in the same spirit, adding to the dialogue respectfully and thoughtfully. I would like to address some thing Neal brought up. First off, the issue of temples. No where in the entire Bible do we read about entering the temple by having to sit down and go through the list of the temple recommend. Then we read in the new Testament that the veil of the temple was torn in two. Mat 27:51 And, behold, the veil of the temple was rent in twain from the top to the bottom; and the earth did quake, and the rocks rent. We no longer have needs of the temple or needing to go in to them. Then Neil goes onto say The temple is, among other things, a place to make covenants with God to serve him and to build his kingdom and to maintain our obedience to his laws and commandments. If your falling short of keeping the law, your under a curse. Then Neil said they sacrifice their time to attend meetings and to serve others, and they do everything else necessary to qualify to attend the temple. In order to enter the Temple you must first be Baptized. But here is another problem I find, Jesus did not Baptize everyone. John 4:2 (Though Jesus himself baptized not, but his disciples,). If Jesus was not baptizing People and paul goes on to say later, Jesus did not send me to baptize, Why are the LDS making it into a Law/Doctrine in order to be saved? According to these verses, Beliefe in Jesus is all that is required to be saved, No mention of Entering any temple first, or being baptized first. And LDS do teach needing to be baptized and enter the temple in oder to enter the highest heaven, And Bruce Mc, teaches Anything less than Exaltion in the Higest heaven is damnation. Then in Mormonism, in the Temple Recomend, we are told to Obey the Word of Wisdom, and the Word of Wisdom teaches to eat meat sparlingy, yet the Bible speaks about people who will teach this false Doctrine. Thanks for your comments. You will notice in my post that I specifically did not try to tell anybody that their thoughts or beliefs were wrong, let alone that they had a “false religion”. I thought the original post was interesting and raised some interesting questions and I hoped to clarify from an LDS perspective. We can strongly hold onto our personal beliefs, bu dialogue requires a more thoughtful, less confrontational approach. You can take the approach you wish, I’m just explaining where I am coming from. I’m not certain how you interpret that, but we certainly are not alone in the Christian world to believe that Jesus is teaching the necessity of baptism as a requirement to enter the kingdom of God. We believe that His own baptism, “to fulfill all righteousness” also shows us the importance of that ordinance in the Gospel of Christ. If He who committed no sin required baptism, how much more do we who are sinful require baptism? I thought the purpose of repentence, made possible by the atonement of Christ, was to allow imperfect mortals to continue to improve, overcome the world and become more and more like Jesus, our perfect example? To me, repentence isn’t a one-time event, but an ongoing process. If that is true, how am I cursed by falling short of the law? I don’t understand this. I have personally accepted Christ as my Savior and recognized that without his merciful and perfect atonement I could never enter the kingdom of God. How then am I condemned by you, Rick B., for trying as hard as I can to do the other things I believe he wants me to do? I have met the requirement — the ONLY requirement — that you tell me is necessary. If after I have done this I try to do other things that bring me coser to Christ, that bring to my life a measure of purity of mind, body and spirit, I seek to know more of his word and be obedient to the things I believe he has taught and repent when I fall short, how do you condemn me? I have met the scriptural level you set forth. I know I can’t do less, but why can’t I try to do more (as long as it continues to bring me closer to Christ)? I’m not sure I see a problem — we are to use these blessings with thanksgiving — not abstain from them, only be wise and use them sparingly. My confession of Jesus as my Savior and my recognition of his divinity, my love for his perfect life and my desire to be like him have been the guiding principles of my life for as long as I can remember. I hope that our mutual understanding of this reality can allow us to have a meaningful, respectful and productive dialogue. NOw on my blog I did a topic on works, it is in 4 parts, the first 2 parts cover the LDS idea of having to do works to aid in our salvation, along with this I put scanned copies from Offical LDS sources to prove this. My next topic to be posted, before the end of the week will be about the issue of baptism. THen Neal you said My confession of Jesus as my Savior and my recognition of his divinity, my love for his perfect life and my desire to be like him have been the guiding principles of my life for as long as I can remember. I hope that our mutual understanding of this reality can allow us to have a meaningful, respectful and productive dialogue. Let me say Up front, we do not worship the same Jesus, You jesus is nothing more than a false god made up by a false prophet Joseph Smith. Then when you say I hope that our mutual understanding of this reality can allow us to have a meaningful, respectful and productive dialogue JUst understand, I am like Paul, I tell it like it is, I come across hard and in your face, some people do not like that, Well I dont want you to Misunderstand, Paul said in GAl 1:8-9 You teach another GOspel you will go to hell. Jesus was loving, yet He drove the Money changers out with a whip of cords, He was loving, yet said really hard things to the religious of His day. It is this wimpy cannot offend anyone attidue of soctiy today that is allowing people to go to hell and believe a lie. Sadly people will not speak the truth, because their afraid of offending someone. Well Jesus says in Rev, be Hot or Cold, Not luke warm, I am either Hot or cold. My approach is this, Most LDS do know that what they believe verses the avrage Christian are worlds apart, The LDS tend not to be very honest and up front about their beliefes. I was adding things that you choose not to for whatever reason. Like LDS teach Grace plus works, LDS teach baptizm IS REQUIRED FOR SALVATION. How come the LDS tend not to say this, they know most Christians dont fully understand what LDS believe. I cover this issue on my blog also. Example, If I said, Neil who do you believe Jesus is, I strongly suspect you would say, I believe Jesus is the son of God. The fact that Mormons go to the temle is not a sign of us being better than anyone else . It is a sign of us trying to better ourselves . We do not think that we are better than the outside world , but that we are encouraged to stand out , and like it says in the Book of Mormon , Be in the world but not of the world . This world is dirty filthy and disgusting . We go to the temple to better our spirits and help us resist the temptations of this world . Neil, one must believe in the Jesus of the bible and your own president Mr.Hinkley has stated that mormons DO NOT believe in the Jesus of the bible. So I guess moormons do have to continue on the treadmill of works.